UGC NET December 2018 Answer Key Download: Central Board of Secondary Education (CBSE) has successfully conducted the UGC National Eligibility Test (NET) on 18th, 19th, 20th, 21st, 22nd December 2018 for the applicants of this test. Candidates who are looking for a lectureship job for various subjects under the CBSE has applied for this test and qualifying both sessions of the exam will make them eligible for the next level of the selection process. After the release of the notification regarding this UGC NET exam 2018, a large number of candidates from across the country has applied for this exam and shortlisted candidates have already completed the test. Now, all these candidates are eagerly searching for the CBSE UGC NET Exam Answer Key 2018 to match their answers. As per the news, the officials will soon update the answer key in their official web portal in a few days for all the three papers. To know more information, you can see the below-given information. Every year CBSE will conduct the UGC NET exam two times that is one in the month of December 2018. This is the eligibility test for Junior Research Fellowship and the candidates will also be eligible for Assistant Professor posts at different private and government institutions is they are qualified in this test. In this year this was the second time that CBSE UGC NET exam is conducted i.e., in 18th, 19th, 20th, 21st, 22nd December 2018 and many eligible applicants have appeared for this exam successfully and completed the test. All the candidates are now waiting for the release of the official answer key of this CBSE UGC NET 2018 exam. As per the authorities, it may take few more days to release the official answer sheet of the exam and so the candidates need to be patient and stay tuned with the official website for this. Meanwhile, we do provide some answer keys of the three CBSE UGC NET papers i.e., paper-I, paper-II and paper-III which was conducted in morning and evening sessions in December month 2018. These answer sheets were released by various professional institutions prepared by the experts. So, those who are eager to check their answers and estimate their score to know their performance in the CBSE UGC NET exam that was conducted on December 2018 can check out these answer keys from the below-given links. To download the official answer sheet of CBSE UGC NET Dec 2018 from the official website, the candidates can follow the below-given procedure. CBSE had conducted UGC NET Examination on 18th, 19th, 20th, 21st, 22nd December 2018. CBSE UGC NET 2018 Paper 1 and paper 2 All Set’s Answer Key is given below. 1. Dear students these are the multiple choice questions which have been answered very carefully still there are some chances where UGC may differ in their answers in that condition we suggest you to follow honourable UGC only. 2. If there are any possibilities of revised answers then we will upload on internet & we will inform you. 3. For the comfort of students numerical answers have been converted in alphabetical answers. Candidates have to score at least 40 percent aggregate for General and 35 percent aggregate for OBC (Non-Creamy Layer)/ PWD/SC/ST) – The cutoff marks are defined for an aggregate of all 3 papers. Using these qualifying marks and the by checking the answer key, the candidates will get an overview of their result in the exam. Go to the official website or click the direct link given herein below link. 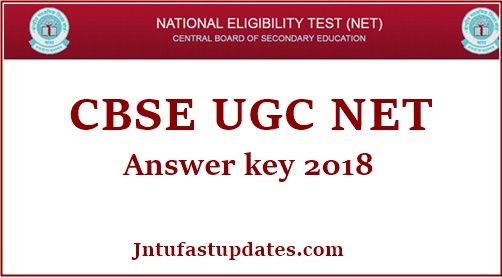 Look for CBSE UGC NET Answer Key 2018 and click the link if you found. In a new window, you will see the CBSE UGC NET December Answer Key 2018. Select the correct code from the given list. Now, a PDF will be opened with CBSE UGC NET Answer Key in it. Download it and match your answers.